With a battery problem or an alternator issue, your car won’t be able to run. Beyond that, if you have an issue with any of the other electrical components of your vehicle, you could lose certain functionalities that are essential to driving (for example, your dashboard gages can fail). When these issues crop up, we’re here to help. Here at Urban Autocare, we provide battery and electrical service for folks throughout the Denver Metro area, including residents in City Park, Park Hill, Washington Park, Downtown, and Uptown — we also have a convenient auto shop location in Lakewood. If you’ve noticed an issue with your vehicle, schedule an appointment for service right away. You can also continue reading to learn more about some common signs that your electrical system is failing, and you can read about how batteries and alternators work together to power the components of our vehicles. Car won’t start: As we mentioned, if your car won’t start you could be facing a variety of issues. We’ll run diagnostics on your alternator and battery to test if they produce and hold a charge, and we’ll check your starter plug. You may also have a faulty ignition. Again, we’ll determine the source of the issue so that you can get back on the road. Loss of power to components: If you lose power to one or multiple components of your vehicle, you may have blown a fuse in your vehicle, you may have lines that have been cut, or you may be facing a different issue with the components themselves. You may be able to locate your fuse box to check for blown fuses on your own (consult your owner’s manual, if you’d like to attempt a repair). Otherwise, feel free to bring your car into the shop to have one of our mechanics take a look. Flickering electrical components: If you have flickering electrical components in your vehicle, then you may have loose wires, or your battery or alternator may be failing. It’s best to bring your car into the shop right away so that your electrical system doesn’t completely fail while you’re out on the road. Alternator issues: If your alternator isn’t working properly, it won’t maintain a charge in your battery, nor will your electrical components continue to work. If you’ve lost power to all of the components of your vehicle and it will no longer start up when you turn the key, then your alternator may be to blame. Battery problems: Similarly, if your battery fails then your vehicle won’t start up. Normally, your battery should hold a sufficient charge to kickstart your vehicle by running the ignition and starter components of your car. With a bad battery, however, you won’t be able to hold enough of a charge to get your vehicle started. If you can jumpstart your vehicle, yet it won’t start again after running, then it’s likely that your battery is to blame. Bad starter: Your starter is responsible for getting your engine started. If you have a faulty starter, it may no longer be receiving the electricity required for the ignition of your vehicle. You may also have a faulty spark plug. We can assess the true issue at hand. Failed blower fans: If your blower fan is failing, then you may notice temperature fluctuations as you drive, and your vehicle may overheat while you’re travelling over the tarmac. You may also notice that your vents don’t pour out warm air when you turn on the heat in your vehicle. If you notice any of these issues, then your blower fan may have failed, or it may have a faulty power source. Fuel pump malfunction: If your fuel pump switch fails (which can be an electrical issue), then your vehicle may die while it is running, or it may fail to start. The fuel pump switch enables or disables fuel flow throughout your vehicle, and a failed switch will bring it to a halt. How Does Your Battery & Alternator Work? Your alternator and battery work together to power all of the other electrical components of your vehicle. Your alternator pulls a bit of power from your engine as it runs, and that power is converted to electricity, which can be routed to other components throughout your vehicle. In addition, some of this power is routed to the battery of your car, where it can be stored. This stored energy is then available when you start your engine, and if you’re using any of the electrical components of your vehicle while the engine is off (e.g. the cabin lights or stereo). So, if either your battery or your alternator fails, then your engine will no longer be able to start. Fortunately, we can test whether or not your battery holds a charge to determine the source of the issue — just bring your car into the shop! 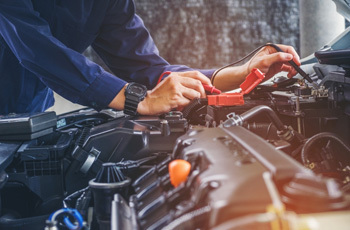 When your vehicle is losing power to its components, or it has lost power altogether, you can count on our expert technicians to uncover the source of the issue. Reach out to us today to schedule an appointment for your electrical issue!